Step-by-step instructions on how set privacy/content view restriction for a Gallery. • Version used for the screen captures: WS.WebTV Professional 3.1 (all extensions enabled). Some options/features might be different, respect your WebTV, depending on the installed version and extensions you have purchased. (Screen capture from the Privacy tab of a Clip, which is essentially the same for Galleries). The Gallery will require login in order to be viewed. However, the logged User's Access Level must be equal or greater than the specified one; otherwise, it will not be allowed to view the Gallery. For example: If you set Access Level to "Author", any Author, Admin or Webmaster will be able to view the Gallery, but Contributors and Subscriber won't. The Gallery will require login in order to be viewed. However, only allowed Users will be able to view the Gallery. 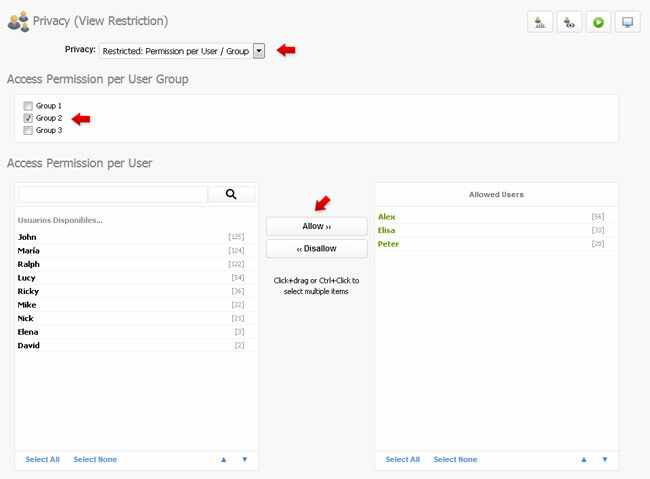 At the top, you can select the User Groups that you wish to give permission to. At the bottom, you can select, individually, the Users that you wish to give permission to. ...Save the Gallery when you are done.